The longest north-south Interstate in Pennsylvania, which was also planned to be a toll highway, has its beginnings back in the 1950s. In fact, the part from Scranton to the New York line was to be a continuation of the Northeast Extension, but no final designs were completed by the Turnpike Commission. Another extension that would have followed the current I-81 alignment, referred to as the Scranton Extension, and connected to the mainline Turnpike anywhere from east of Harrisburg to the Delaware River Bridge. This was also planned before the Federal-Aid Highway Act of 1956 that was passed on June 29 of that year. With the act passed, work on this highway was transferred over to the Department of Highways. In 1958, construction began on the part from Exit 188 to Exit 191. 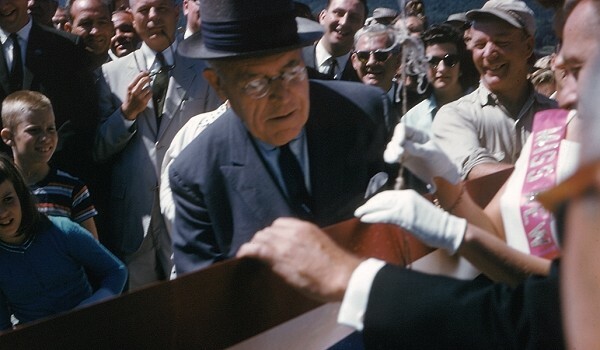 In 1959, construction began on the section from the Maryland state line to Exit 3. Another section was under construction at the same time from Exit 194 to the New York state line. In 1960, the section from Exit 188 to Exit 191 was completed. In 1961, more of Interstate 81 opened from Maryland to Exit 3 and Exit 211 to the New York state line. 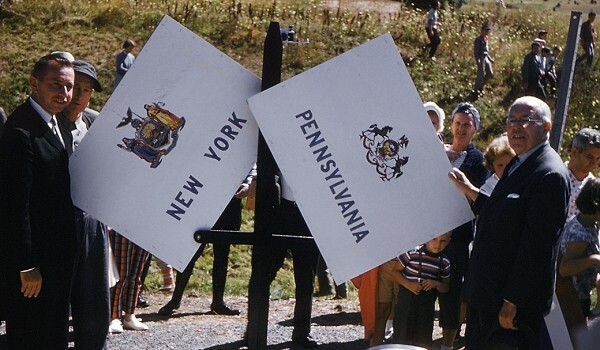 Representatives from both Pennsylvania and New York standing at the state line. Governor David Lawrence cutting the ribbon to signify the completion of Interstate 81. While those sections opened that year, work began from Exit 44 to Exit 48, Exit 187 to Exit 188, and Exit 191 to Exit 194. In 1962, the sections from Exit 44 to Exit 48, Exit 187 to Exit 188, and Exit 191 to Exit 211 opened while construction got under way on the sections from Exit 3 to Exit 44, Exit 48 to Exit 52, and Exit 186 to Exit 187. 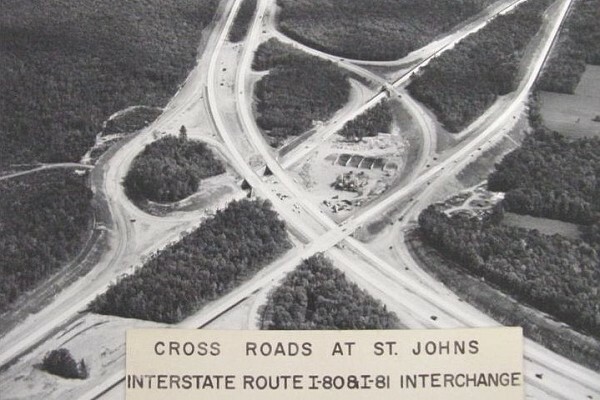 In 1963, the sections from Exit 3 to Exit 5, Exit 48 to Exit 52, and Exit 186 to Exit 187 opened to traffic while construction began on the Exit 170 to Exit 175 section. The current Exit 187 in the 1960s. Interstate 81 is from bottom to right in the picture. In 1964, the sections from Exit 29 to Exit 44 and Exit 170 to Exit 175 opened to traffic while construction began from the Butler Drive overpass to Exit 170, Exit 175 to Exit 178, and Exit 180 to Exit 186. 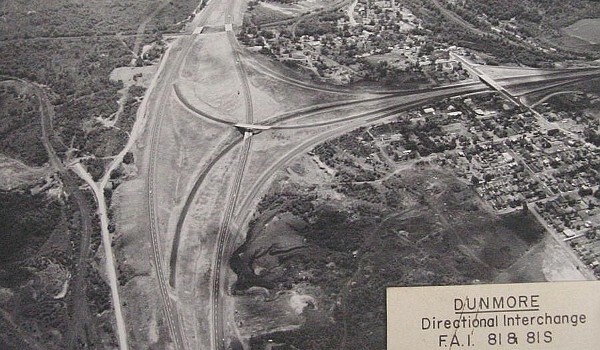 In 1965, the section from Exit 5 to Exit 29 opened to traffic while construction commenced on the sections from Exit 134 to the Lofty Road overpass, Exit 145 to the Butler Drive overpass, and Exit 178 to Exit 180 which included upgrading the then PA 315 alignment. In 1966, the Interstate opened from Exit 165 to Exit 170 and Exit 175 to Exit 186 while construction began from Locust Lake State Park to Exit 134 and Exit 143 to Exit 145. In 1967, the section from Exit 145 to the cloverleaf at Interstate 80 opened to traffic, while construction began on large sections: Exit 77 to the Interstate 78 interchange, PA 72 underpass to Locust Lake State Park, and Lofty Road overpass to Exit 143. Construction of the PA 72 to Locust Lake State Park section involved more than moving ground, it also involved demolishing a village. Rausch Creek, a former Philadelphia and Reading Coal & Iron Company town, was built around the turn of the 20th Century and located approximately a mile south of the US 209 interchange. Engineers will looking for an easy grade to take the Interstate from north of Pine Grove to the top of Broad Mountain, and when the surveyors from the Department of Highways came to stake out the proposed alignment in 1965, it meant the death knell for the village. By 1967, Rausch Creek was a virtual ghost town as families had already moved to Tremont, Pine Grove, and other nearby locales. They left willingly because they decided not to halt construction on a highway that was considered vital to the economy of the area; however, they received no financial compensation because mining interests owned the properties and houses. In 1968, the sections from Exit 143 to Exit 145 and Interstate 80 to Exit 165 opened to traffic, while construction began from Interstate 83 to Exit 77 and Interstate 78 to the PA 72 underpass. In 1969, the section from Exit 116 to Exit 143 opened to traffic, while construction began on the sections from Exit 52 to the Locust Point Road overpass, Exit 65 to Exit 66, and Exit 69 to Exit 70. 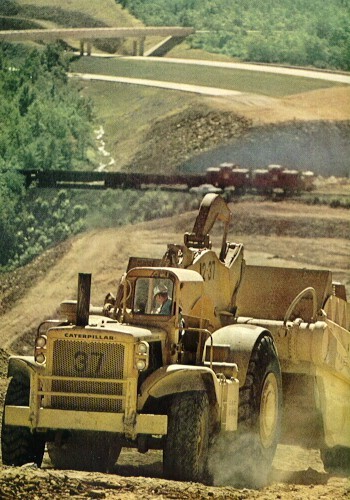 Construction going on south of Hazleton in 1968. In 1970, the sections from Interstate 83 to Exit 104 and Exit 112 to Exit 116 opened and work began on the section from Locust Point Road overpass to Exit 57. In 1971, the section from Exit 104 to Exit 112 opened to traffic while construction began on the section from Exit 66 to Exit 69 which included construction of the large stack interchange at US 22/US 322 in Wildwood Park. In 1973, work began on the section from Exit 57 to Exit 65. This signaled Interstate 81 was either complete and open to traffic or under construction through the Commonwealth. 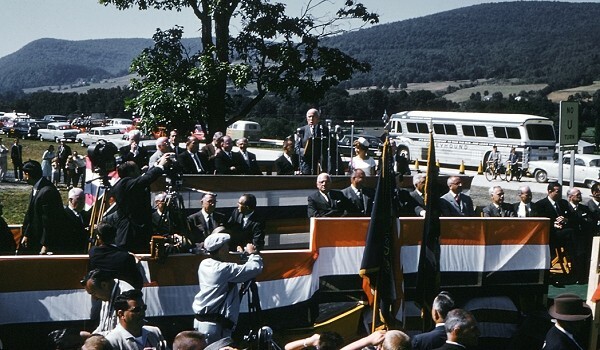 In 1975, the section between Exit 65 and Exit 66 which included the George N. Wade Bridge was finally completed, and the following year, the remaining sections from Exit 57 to Exit 65 and Exit 66 to Interstate 83 were completed just in time for our country's Bicentennial celebration. The final cost of Interstate 81 from Maryland to New York was $442,950,000. Work began in April 2001 to rebuild the highway from Exit 20 to north of Exit 24. The $25.4 million project included complete pavement removal and concrete replacement on both the northbound and southbound highways and shoulders, extension of the ramps at two interchanges, bridge improvements, new drainage, improved guiderails, and updated signing. Bridges carrying Pine Stump Road, PA 696, and Mainsville Road were also rehabilitated. The work was completed in Fall 2003. Work also began in that same month on another section of I-81 from the Susquehanna River to north of the interchange with Interstate 83. This six-lane section of Interstate 81 carries nearly 100,000 vehicles a day, with truck traffic accounting for 24% of the volume. Next to the Syracuse, New York area, this is the most heavily traveled section of the Interstate between Knoxville, Tennessee and the Canadian border. This was also one of the roughest sections of concrete pavement to be address by PennDOT in their commitment to improve the Interstate Highway System of Pennsylvania. The $74.5 million project included reconstruction of all six lanes of the highway and shoulders, some interchange ramp improvements, rebuilding bridge decks with some widened, upgrading signage including installation of new overhead variable message signs (VMS), new drainage, and new guiderail. Longer on-ramps from Interstate 83 were built with the entire project completed in 2004. Northbound traffic and construction at the I-83 interchange. On May 16, 2001, State Senator Terry Punt secured a commitment from the Pennsylvania Department of Transportation to start the process of widening the highway to six lanes on a 77-mile section in southern Pennsylvania from the Maryland state line to PA 581 and from I-83 to I-78. Also, the ramps onto and off of the Interstate would be lengthened to current standards. The state would join Virginia, West Virginia, and Maryland in planning to widen the current four-lane Interstate. PennDOT recommended to the Pennsylvania Transportation Commission on May 24 that the study be given "immediate priority status" on the commission's 12-year plan. The $12 million state and federal-funded study by DMJM Harris was completed in 2004. 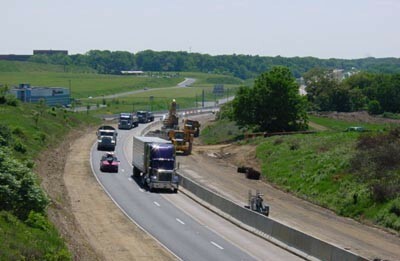 In 1998, a multi-state task force recommended that Pennsylvania study widening the highway; however, PennDOT emphasized improving the highway surface. The senator lobbied during the past four years to win approval of the project. He said that the highway is currently being "strangled and suffocated" by the volume of traffic, which it was not designed to carry. The entire project would cost $1 billion, which was raised to $1.8 billion by the American Association of State Highway and Transportation Officials by June 2010. Drivers traveling between mile marker 108 and mile marker 158 could breathe a little easier starting December 6, 2001. PennDOT unveiled 102 emergency call boxes that day that were installed earlier in the year along the highway between those two points in Schuylkill and Luzerne Counties. Those needing help could find four buttons inside the boxes: one for police, one for fire, one for ambulance, and a fourth for a tow truck. After they pressed a button, they had the ability to talk to a state police dispatcher who made sure the appropriate crews were dispatched to the scene. The reason that this section was picked is that the area is prone to dense fog, high winds, and severe winter weather conditions. The boxes were a part of a $1.6 million Intelligent Transportation System project that included weather monitoring stations, variable message signs, and traffic counters. However, they didn't last long, as PennDOT cut the cord on April 12, 2004. Many of them had quit working a year earlier, and although PennDOT promised to fix them, each call box cost $1,000 to operate and with the proliferation of cell phones, the decision was made to scrap them altogether. Prior to this, the only highways in Pennsylvania with call boxes was the Turnpike and its extensions, and I-80 between Exit 212 and Stroudsburg in the late 1960s. December 28, 2001 was not a good day to be on the Interstate, as a wreck on the highway outside of Hazleton claimed the life of a 13-year-old girl, according to the Luzerne County Emergency Management Agency. The crash involved about 30 vehicles and caused multiple injuries. On September 24, 2002, Mayor Tom Newcomer of Chambersburg cast his first tie-breaking vote when Borough Council hit a deadlock on the issue of construction of the long proposed Exit 17 and another south of the town. Councilman Allen Coffman, agreeing with a citizens' group on the matter, said that federal funding should be directed from the Exit 17 project to construction of an exit south of Chambersburg to serve numerous warehouse and distribution centers that have opened there, one of which includes the Chambers-5 Business Park. David G. Sciamanna, president of the Greater Chambersburg Chamber of Commerce has said of the controversy, "The whole agricultural protection argument was grasping at straws and just a way to find any reason to delay the project. I think it is over." Supporters of the exit say that it will ease congestion on US 30 and offer an alternative route to new development north of Chambersburg. Critics say that it will not solve congestion problems, and will dump more cars on country highways and pressure rural Greene Township to develop. One thing parents do not like while driving are noisy children in the backseat. However, it is just that which saved Patsy Harvey of Muncie, Indiana on July 5, 2003. She climbed into the backseat to quiet her grandchildren, while her husband Selby continued to drive southbound on the Interstate. Minutes after doing so, a log from an overturned truck on the US 22/US 322 ramps above, came crashing down through the passenger-side windshield. Around a dozen logs, each weighting around 1,000 pounds each, spilled onto the ramp with that stray one falling over the side and onto Interstate 81. The family and driver of the truck were taken to Holy Spirit Hospital and treated for minor injuries. In March 2004, the 15-year-old battle over the long proposed Exit 7, now Exit 17, at Walker Road near Chambersburg finally came to an end. The Department of Transportation began a $15.7 million project to not only build the Walker Road interchange but also rehabilitate approximately 3.8 miles of the Interstate from US 30 to approximately one-quarter mile south of Exit 20. Median shoulder widening and addition of auxiliary lanes between US 30 and the new interchange resulted in a six lane expressway. Walker Road's overpass was relocated approximately one-quarter mile south of the former location. Construction on Interstate 81 included pavement patching, bituminous pavement overlay, and guiderail, drainage, and signing improvements. The project concluded on September 30, 2005. Even when the winter is turning the corner into spring, the Interstate can be treacherous. On the afternoon of March 5, 2004, twelve vehicles including a tractor-trailer and box truck, were involved in the pile-up between McAdoo and Frackville. Not only did emergency crews have to deal with this one, but also two minor accidents on the northbound lanes north of the pile-up and another in the southbound lanes in the same area. The cause was determined to be fog. It didn't take long for crews to have the accidents cleared and Interstate 81 to reopen that night. Wednesday, February 14, 2007 will be remembered more for the snow and ice storm than romantic evenings for most of eastern Pennsylvania. Even those just passing through, or attempting to, on the Interstate won't soon forget Valentine's Day 2007. As conditions began to deteriorate with seven inches of snow followed by three inches of ice, several tractor-trailers began to jack-knife and others becoming stuck trying to negotiate the Interstate. PennDOT closed it between Exit 85 and Exit 165 on Thursday, February 15 and it did not reopen until 4 PM on February 17. The storm and the problems it caused forced Governor Ed Rendell to declare a statewide disaster emergency which authorized state agencies to use all available resources and personnel to assist in relief. It took 150 employees with 141 pieces of equipment to clear the ice and snow off I-78, I-80, and I-81. It takes a really big snow storm to close roads and that is exactly what hit on February 9, 2010. Governor Rendell took proactive measures and closed I-81 from Maryland to I-80 at 2:00 PM the following day. In a press release he stated, "For your safety, do not drive. You will risk your life and, potentially, the lives of others if you get stuck on highways or any road. The National Weather Service issued blizzard warnings for several counties in Pennsylvania and visibility is at or near zero. Motorists must stay off Interstates 81, 83, and 78 until my administration lifts the restriction," which happened on February 11. The Harrisburg morning commute on May 9, 2013 was not a smooth one for those who regularly use US 22. At 6:10 AM, a tanker truck hauling 7,500 gallons of diesel fuel traveling the ramp from Interstate 81 northbound to US 22/US 322 westbound lost control and crashed, bursting into flames. Fortunately, no other vehicles were involved and the driver managed to escape the cab before the truck exploded, which burned for about 45 minutes and caused guide rail to melt and the roadway surface to explode. The fuel that did not burn leaked into Paxton Creek and the lake in Wildwood Park. US 22/US 322 and Interstate 81 were closed immediately so PennDOT could determine the structural integrity of the affected bridges. The ramp where the accident took place as well as the bridge that carried US 22 eastbound south towards downtown Harrisburg would both need replaced. Traffic on US 22 westbound and the ramp from it to I-81 northbound resumed later that morning at 10:30 AM, the ramp to I-81 southbound at 1:40 PM that afternoon, the ramp from I-83 northbound to I-81 southbound reopened at 4:45 PM, and later that night, Exit 61 and Exit 65 reopened. Governor Tom Corbett signed a disaster emergency proclamation on the night after the accident. "This accident has created a traffic nightmare for thousands of citizens as they try to go about their daily lives to work, school and other activities," Corbett said. "But the economic impact across the Northeast United States and Mid-Atlantic region is potentially staggering when you consider the amount of commerce that travels through Pennsylvania on these roads every day." To provide a detour route, the Turnpike Commission waived tolls for anyone entering and exiting at Exit 226/Carlisle and Exit 247/Harrisburg East from May 9 to midnight on May 13. 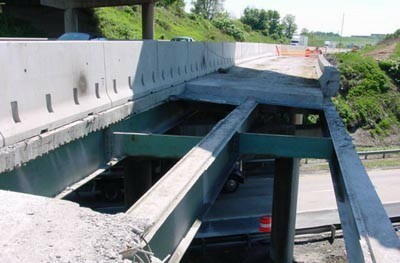 Demolition of the affected spans began on May 10, with the first being the US 22 eastbound span. At the same time, temporary median crossovers were built north and south of the bridge to restore eastbound traffic was happened at 3 PM on May 12. Demolition of the US 22 span was completed the following day at a cost of $2.1 million, with Interstate 81 northbound traffic being restored at 7 PM and southbound traffic at 7:35 PM. PennDOT learned on May 14 that the USDOT released $2 million in emergency funds to pay for work getting the Interstate reopened. The new eastbound span opened to one lane of traffic at 3:20 PM on November 14, 2013, and the $3.3 million phase officially came to a close a week later at 1 PM after the temporary crossovers were removed and guiderail installed. US 22 westbound was restored to two lanes of traffic a little after 3 PM on November 21. A ground breaking ceremony, with PennDOT, state, and local officials in attendance, took place on July 10, 2013 for the reconstruction of Exit 178 in Luzerne County. Work began in June of that year and will entail widening the Interstate as well as rehabilitating existing bridges over Lidy Road, PA 315, and Plane Street, replacing the pedestrian bridge just north of Exit 178, construction of new exit and entrance ramps, three new roundabouts, construction of two new bridges, and construction of a new roadway. On March 25, 2014, the northbound and southbound ramps at Exit 178A were closed in preparation of the combining of the two interchanges. The $41.9 million project is expected to be completed in November 2015. Road rage is a problem on roads, and on the morning of January 4, 2014, it took a deadly turn when a man from Maine was shot and killed along the southbound lanes near Exit 3 in Franklin County. Timothy Davison called 911 while traveling northbound around 2 AM and told operators he had been chased at least 15 miles by a truck that looked like a Ford Ranger and one of the occupants was firing a weapon at him. The suspect rammed the victim's vehicle, forcing it into the median, and once it was disabled, the suspect approached and fired several rounds. State Police have offered a reward of $10,000 for any information leading to an arrest, and the family of Timothy Davison has offered an additional $10,000. A break in the case was announced on February 19 by the State Police after forensics released details about paint that was lifted from the victim's SUV. It has been determined the suspect was driving a Lapis blue Ford Ranger truck that was manufactured between 1993 and 1997. Divots began to appear in the pavement along a 20-mile-long section in Luzerne County in May 2014. PennDOT engineers took core samples from the Interstate in the area that had been resurfaced just two years prior. The cores that were extracted all crumbled in the cross-section of the pavement that was laid in 1988, but the pavement that was laid during construction of I-81 held together. In all, over a dozen core samples were taken from different parts of the expressway on May 13. Those samples were then shipped to a testing facility in Harrisburg to determine what happened and the proper course of action to fix the problem. Page updated September 30, 2014. Information courtesy of the Pennsylvania Department of Transportation, the Public Opinion of Chambersburg, the Associated Press, the Harrisburg Patriot-News, the Reading Eagle, WNEP-TV Scranton, the Easton Express-Times, United Alert, Rand McNally, Alex Nitzman, Chris Wright, and Jason Cowdell.